As Avingard left Fort Greymoor he noticed that the cloudy sky had given way to a sunny day. With the sun now shining, the air now felt much warmer as Avingard continued his journey. The sun also added another benefit for Avingard as he traveled, the air became more clear and Avingard could see greater distances compared to when it was cloudy. The clear air allowed Avingard to see a figure in the distance running towards him. It was running at a great speed, and as it came closer Avingard could make out an Argonian wearing black and dark read clothing. Recognizing the clothing, Avingard quickly realized that it was a Dark Brotherhood assassin. Avingard was confused as to why a Dark Brotherhood assassin would be running along the road towards Fort Greymoor, and Whiterun, he stopped along the road. Suddenly, the assassin drew a short sword in its right hand and a dagger in the left and continued to run towards Avingard. At this point Avingard reacted quickly and drew his sword in preparation for what was about to happen. 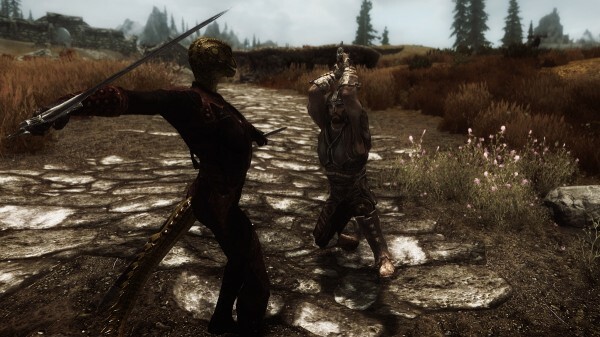 The Argonian leaped at Avingard slashing with both swords in a quick and effortless movement. Avingard blocked the first sword by the dagger rang true and caught Avingard in his right arm. Jumping back to avoid another strike from the assassin, Avingard attempted to lift his sword with both arms, but the pain in his right arm prevent him from lifting his sword. Smelling blood, the assassin lunged again at Avingard, thrusting first the sword and then the dagger, barely missing with both. Needing a healing potion, Avingard swung his sword with his left hand in the hopes of driving the assassin back, and give himself some time to use a potion. Unfortunately, the assassin, while driven back a few feet, quickly renewed his attack on Avingard, striking him in the left shoulder and causing considerable pain to travel throughout Avingard’s body. Now more than ever Avingard became desperate for some time, at least enough to quickly gulp a healing potion. Mustering all the strength he had, Avingard swung his large sword with both arms as the pain intensified in his body, and struck the assassin on the left side and sending it to the ground, dropping his sword and dagger in the process. Quickly dropping his sword and taking out a potion, Avingard quickly drank the entire bottle and immediately felt relief from the pain. The assassin quickly found his weapons and turned to once again resume his attack. He halted briefly when he realized that Avingard was not healed and held his sword at the ready. Both stared each other down in the middle of the road for a minute, before lunging at each other, causing all swords to collide in a massive clang that echoed off the nearby cliffs. This last attack knock both back. Avingard battling an assassin from the Dark Brotherhood. In one final push, Avingard raised his sword above his head, and while the Dark Brotherhood assassin readied for his attack, brought the sword down onto the head of the assassin, killing him instantly. Breathing heavily from the battle, Avingard fell to his knees and dropped his sword to the ground. He realized he was closed to being killed by the assassin if it weren’t for the healing potion he drank. somebody wants this poor fool dead. the contract. Failure is not an option. After reading the note Avingard realized that there was no indication as to who ordered his assassination. He also realized that from this point forward he will need to be more on his guard for other would-be assassins. He knows that the Dark Brotherhood won’t take this failure lightly, and he could expect more assassination attempts in the future. After a few minutes of rest, Avingard puts the Dark Brotherhood note in his pocket, picks up his sword, and then continues on his journey to Solitude.